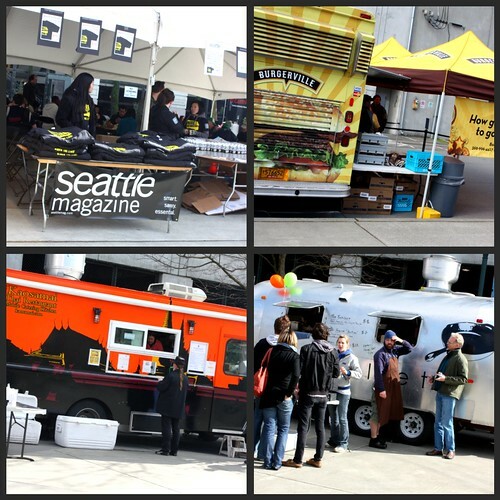 This installment of the Mobile Chowdown took place today next to Safeco Field in Seattle. My very good friend Penny and I arrived shortly after it started at 10:00am. We wanted to be sure to arrive before the lines got too long. There was already a good amount of people lined up at some of the trucks when we showed up. The Seattle Mariners tickets went on sale today across the street, so I'm sure some of the Mariners fans came over for a bit to eat after they purchased their tickets. The Mariner Moose was making his way through the crowd of street food fans. 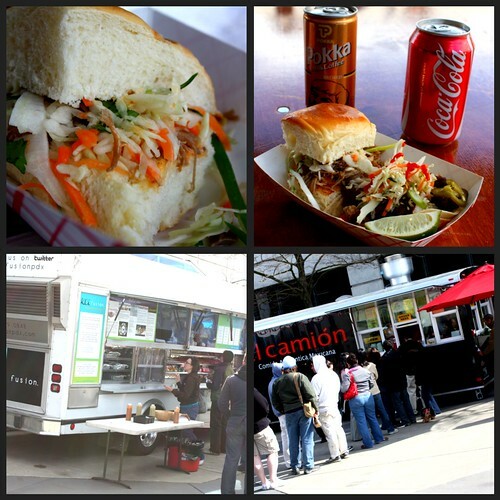 This Mobile Chowdown is the first to include some street food vendors from Portland. The vendors who made the trek up I-5 included: Burgerville, Potato Champion and Koi Fusion. Whiffies was suppose to be in the line-up, but I got word that they never arrived? So I'm not sure if that was the case or not. I know they weren't there when I was there shortly after the Mobile Chowdown started. Koi Fusion and Potato Champion already had pretty long lines early on. 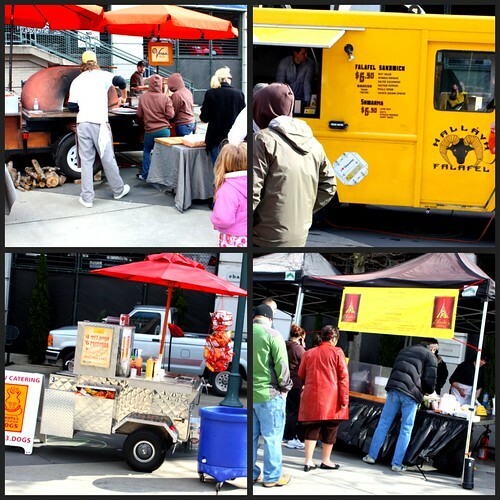 The street food vendors from Seattle included: Marination Mobile, Anita's Crepes, Skillet, Kaosamai Thai, Hellava Falafel, El Camion, Top Pot Doughnuts, Dante's Inferno Dogs, Gert's BBQ, Here & There Grill, Veraci Pizza, and Chipotle Mexican Grill. Marination already had a long wait when we got in line, but that didn't stop us. We wanted to sample some of their great sounding food. Penny and I tried the corn tortillas tacos with sweet & savory kalbi. We also sampled the sliders. I tried the shredded kalua pork slider, and Penny went with both the pork and Spam sliders. 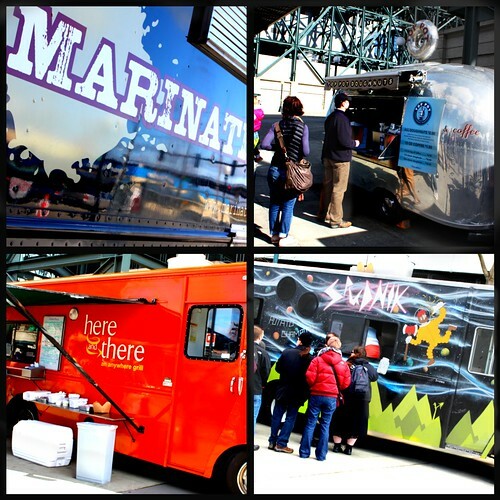 All of the food from Marination was very good! The pork was delicious and the signature slaw on the sliders was the perfect topping. I haven't had Spam since I was a kid, but it never tasted as good as their Spam sliders. The corn tortillas were very tasty. The kalbi tender short ribs are marinated in Kamala's version of the iconic Korean recipe. So far I have not been disappointed by any of the food I have had at the Mobile Chowdowns. According to Mobile Chowdown, they twittered that the next Chowdown will be in July at Seattle Center. Could this be the street food version of the Bite of Seattle? If so, bring it on! See you all at the next Mobile Chowdown! Were you at the Mobile Chowdown today? If so, which street food vendor did you try out? What did you like? Didn't like? Leave me a comment. I was there. What's funny is, I didn't know about the Chow Down Seattle. I just follow Burgerville's blog and they mentioned their Mobile Unit would be in Seattle outside Safeco. since I haven't had Burgerville in years since I moved from Oregon, I went down. The lines were HUGE.... but not in front of Burgerville, I walked up, ordered Cheeseburgers, a Vanilla Shake and walked away. Apparently most people don't know how good Burgerville is. Ha Ha. Anyway, I'm a Foodie also with a blog, and I added you to my newsreader.